I met this dazzling dog when she was a wee little tyke. 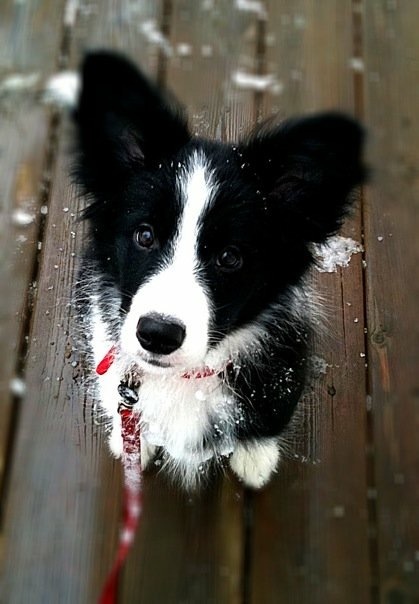 Even as a puppy, Kaia carried a lot of weight on her gorgeous shoulders. She absorbed every sound and sight that came her way and stashed them away in her canine crock. Fortunately, she landed in the perfect home, for her. I still remember saying and thinking simultaneously “that’s BRILLIANT” when her mom announced that she taught Kaia to alert her that the train was approaching to help overcome her fear of the “L” noise in their neighborhood. Read on for Kaia’s story. 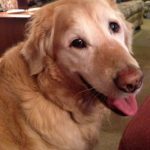 I found Kaia online after our last dog passed away from illness. I couldn’t sleep without a dog in the house and wanted a dog that I could start agility with who had no genetic health issues. We were going to pick up her sister but fell in love at first sight with Miss Kaia. That she’s friendly and enjoys being pet, but she just wants to work. Kaia is super snuggly with our immediate family and naturally thinks her job in the house is to be our service dog. If someone is hurt or sad, Kaia tries her darndest to comfort them. She hates when we’re walking, and random people try to pet her. I keep her a bit scraggly on purpose because it seems to prevent strangers from touching her. I tried to tell them “no, ” but it wasn’t working. My Shaggy Strategy works great to help keep random hands from invading my sweet girl’s space AND helps keep her in a better place. She has the collie wobbles (physically shaky, fearful, and uncertain) so we can’t do agility. We didn’t want Kaia to get hurt or reinforce her nervousness. She also has food allergies. We’ve trained her very well, but stubborn Kaia can be sneaky when bored—she has a deadly taste for chocolate. Kaia can open any fridge and climb any counter. She’s pushed a chair across the room to open the refrigerator so she can eat the sweet treats she watched put away for safe keeping. We have to outsmart our dog DAILY to prevent her from figuring out our McGyver, steel proof containers, and super-sleuth hiding places. What are the biggest obstacles you and your dog have overcome together, and what was most helpful? Whew! We’ve dealt with a lot! A short list: collie wobbles, gastro issues (she is allergic to beef and gets pancreatitis flares quickly), sound fears, and reactivity, dislike of other dogs and strangers, a hearty, independent streak, consistent need to be mentally stimulated, my own health issues, and sharing my attention and time with a child with my very physically and mentally active border collie. Training, training, training, and more training has and continues to help. Not so much for my brilliant girl, but for ME! I had to learn to adapt to situations as they come up and not walk around nervously anticipating what MIGHT happen or I make her more nervous. I had to learn to listen to what she wants and to meet that by giving her what she needs. She acts as a service dog to me because of my health issues and enjoys it. Although, she’d never pass training or be able to travel on a plane because of her sound fears. So, we’ve worked on the things we can do, and with a border collie, the sky is the limit. For example, she would not walk under the L train tracks until I figured out to make it her JOB to alert me when she hears a train approaching. Then we trained to not alert me to planes, ambulances, fire trucks, and all the other city noises that are tough on a sound sensitive dog. It’s always a work in progress. And tons of fun. If you could make a sign for the world to see to understand your dog’s individual needs better, what would it say? You do not always get the dog you think you want. You DO end up with who you need and who needs you. Had I not learned any of this from my pup, mostly by listening—I would not be a good mom to my kiddo who has especially sound reactive SPD (sensory perception disorder). Had we not put so much into dog training and tried to do it all on our own, after I had a kid…wow, everything would have been so much work. My girls (pup and kiddo) though are the best!